The latest in the ‘From my Garden’ series – I can’t believe there are only four more months to go . . . . 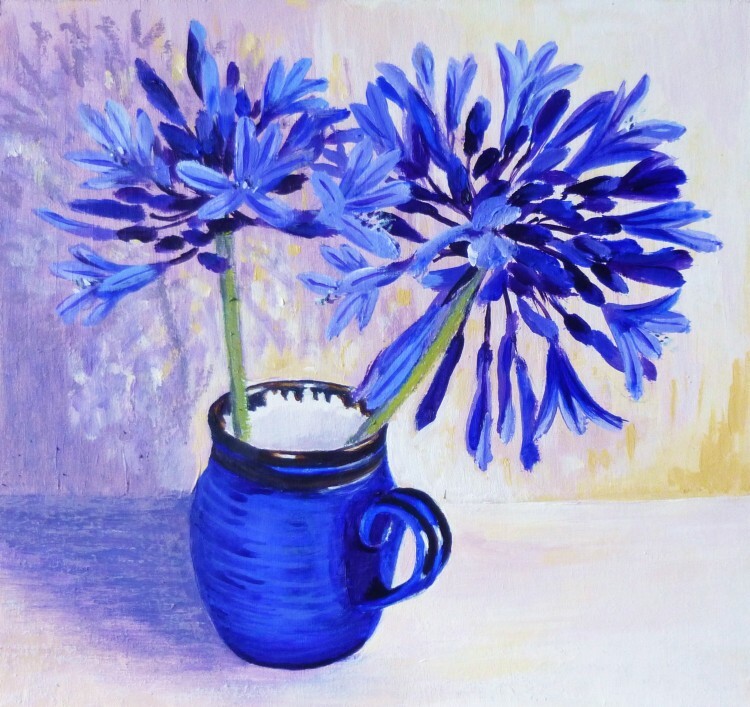 This one shows the dark blue Agapanthus which I bought from Bodnant Gardens a few years ago when I was visiting my friends in Bangor in North Wales. It has done amazingly well this summer and has had 21 flower stems! I could hardly bear to cut any! – but I put just two into a violet-blue mug by Old Leigh potter Richard Baxter, which I bought when he was exhibiting with us earlier this year at the Lexden Arts Festival. I LOVE the beautiful glazes he uses – they have such a depth of colour, and this one almost matched the colour of the flowers! I hope you are enjoying seeing these little flower paintings – I wonder which is your favourite so far? Don’t forget the free give away I am running at present – look for the post titled ‘Jute Bags’ for all the details. There’s just over a week to go! To leave a comment click on the BLUE post title in the box on the right of your screen and a comments box will open under the post. I’ve had some lovely suggestions so far.